Elegant and organized, the CEO Collection from Titan lives up to what its name promises and stands for exclusive luggage with business-style features. The collection's modern design is constructed in an anthracite grey Glen Check fabric and the integrated pleather elements provide an extra visual highlight. The well-designed main compartment and the multiple interior and exterior pockets allow for comfortable business trips and quick-access to documents during your journey. The 22" 4 Wheel Upright is perfect for trips up to 5 days and has a convenient padded laptop/tablet pocket. 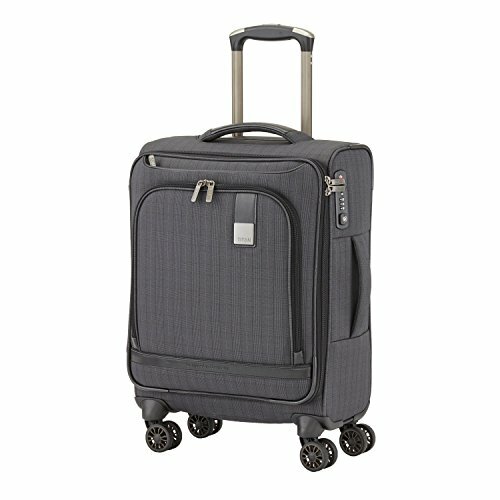 4 dual spinner wheels for easy rolling and mobility; built-in TSA-approved luggage lock; allows TSA to open and inspect bag without damaging lock; front exterior document zip pocket; perfect for travel documents, tickets, etc. Front exterior deep zip pocket; great for last-minute travel items, jacket, etc; interior features 2 packing compartments; top-lid zip compartment with tie-down straps to secure clothing and 2 zip pockets for smaller items, toiletries, etc. If you have any questions about this product by Titan, contact us by completing and submitting the form below. If you are looking for a specif part number, please include it with your message.